At 77 years of age, the federal minimum wage deserves a respite from the day-to-day combat of political life. Today, protestors around the country are demanding a $15 minimum. But few observers think this level is economically desirable: even fewer think that it is likely. Democrats want a higher minimum, and say so loudly. Republicans of a free-market persuasion mostly do not—but tend to stay silent because they know that swing voters look positively at raising the wages of low-earners. 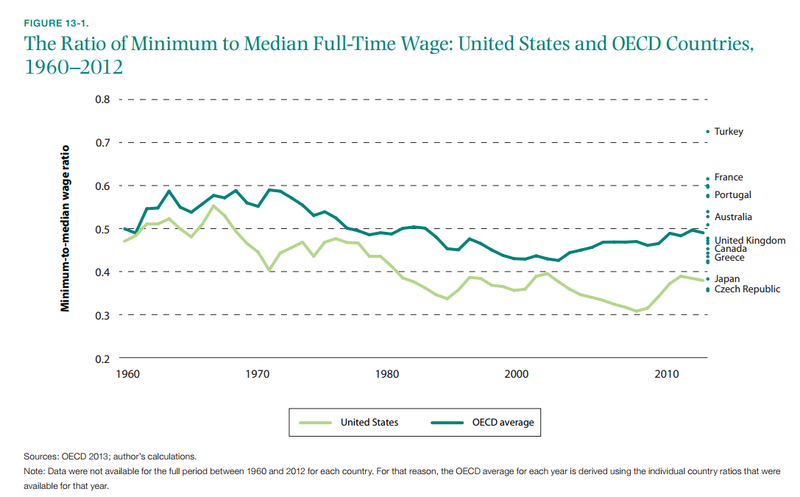 The federal minimum wage is an established piece of the U.S. policy furniture—and one that is quite dated. It now makes sense to consider taking some of the power and responsibility for setting the wage rate out of the hands of politicians—just as interest rates are set by the Federal Reserve. This is not a novel proposal in international terms. In most advanced economies, minimum wage decisions are not purely political. Out of 66 countries studied by Tito Boeri in 2009, 24 delegate the determination the minimum wage level to a tripartite body; 26 countries set the minimum wage after taking advice following formal consultation between the Government and representatives of employers and workers; and just 16 countries (including the U.S.) set the minimum wage through a simple legislative vote. Over in the U.K., the Conservative Prime Minister David Cameron just jacked up the national minimum wage by 3% up to £6.70, with barely a squeak of protest from employers or the right wing of his own party. Why? Because, like his two predecessors, he simply followed the advice of the Low Pay Commission, which is comprised of nine commissioners—three each from trade unions, employer organizations and academia. Can the U.S. follow suit? And if it can, what might the new system look like? Two options at least are worth considering. 1. A Federal Minimum Wage Advisory Board. This could be made up (like the U.K. version) of nine members: three representatives of employer organizations, three from labor organizations, and three independent labor economists. The Board would recommend a rate for the national minimum wage each year, which would then be enacted by Congress in the usual manner. The Board would have a strong incentive to set a rate likely to be adopted by Congress, in order to establish and maintain its reputation: there is, after all, little point in sitting on a Board that is ignored. The Board’s recommendation would not be binding and would not become the legal ‘default’ level. But because the advice is likely to be sensible, Congress would likely be inclined to follow it. 2. Wage Indexation. An alternative—favored by my Brookings colleague Gary Burtless—would be to simultaneously raise the minimum wage and introduce automatic indexing, lifting the minimum wage at the same rate as either consumer prices or the median wage—preferably the latter. In effect, this would do for the minimum wage what President Nixon did for Social Security. Congress would have the power to suspend a rise—perhaps if unemployment reached a certain threshold—but the default position would be to link changes in the minimum wage to changes in the median wage or in the broader consumer economy. These are both examples of what I have called policy commitment devices—in a new paper, Ulysses Goes to Washington—that help to overcome political myopia in order to support longer-term policy objectives. In the first case, taking advice from an independent commission, the commitment is somewhat less binding, although as James Madison knew, ‘the counsels and checks of friends’ can carry plenty of weight. Indexation would be a tighter form of binding, since inaction on the part of politicians would lead to an uprating of minimum wage, rather than the current stasis. For both sides, there are political attractions to sub-contracting some decision-making power over the minimum wage. By accepting the advice of an independent body or allowing indexation to do its silent work, Republicans can keep their business donors and right-wing critics at bay; Democrats can do the same for unions and the political left. Sometimes the most powerful thing politicians can do is give some power away. The minimum wage is now perhaps a case in point.